Lightweight customisable new mail notification utility for any Gmail accounts. 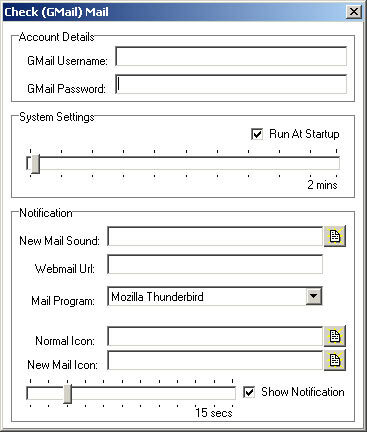 Capable of launching your mail client or a web page of your choosing. Change the alert sound, display a notification box or even customise the icons. Very easy to setup and use, uses minimal resources so instead of running your full blown mail client all the time save it for when it's really needed i.e. you want to read/compose messages. This site does not contain serial number, crack, keygen Check Mail (GMail) serial number : serial number is the simplest type of crack. A serial number(cdkey,product key,etc) is register the program as you may already know. a crack or keygen may contain harmful software. If you cannot find the exact version you want, just give it a try. for more information read .nfo/.txt/.diz file include in zipped file.